Error: Error validating access token: Session has expired on Sunday, 03-Feb-19 06:16:51 PST. The current time is Monday, 22-Apr-19 06:05:27 PDT. 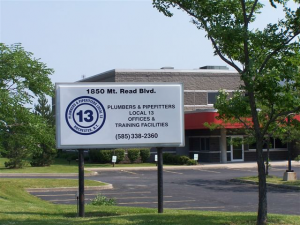 The Leadership and Members of Plumbers and Pipefitters Local 13 would like to welcome you to our website where you can find a great deal of information about us. The Plumbers and Pipefitters of Local 13 work on projects of all shapes and sizes. We actively work at the Ginna Power Plant, the Xerox Toner Building, and the Barilla Pasta Plant. We’re working at University of Rochester and the Medical Center. We can also be found working on homes and small business. The Plumbers and Pipefitters of Local 13 are vital to many industries throughout the Western Central New York and the Finger Lakes Region and it’s because of our highly skilled workforce. We are over 1,200 members strong and growing. We are always looking for the best and brightest that our area has to offer. If you’re an experienced journeymen, visit the Training page to learn more About Us and How to Join. If you’re interested in our Apprenticeship Program you can learn more about it through our website.